Let’s face it. Charedim have never considered any religious zionists—Mizrachisten) “frum enough”. That’s a generalisation, of course. Notable exceptions, such as Rav Shlomo Zalman Auerbach ז’ל or indeed his son-in-law, Rav Zalman Nechemia Goldberg שליט’’א never saw things in black and white (sic). 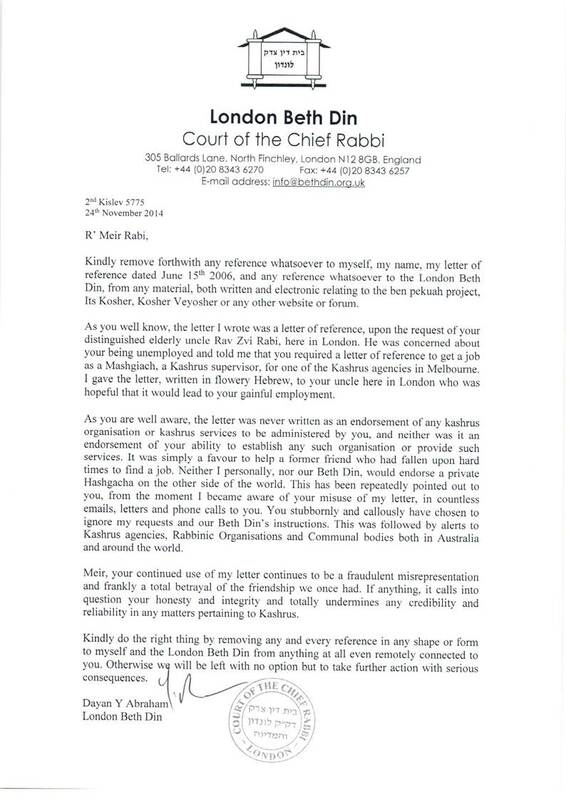 Rav Shlomo Zalman’s son, Rabbi Shmuel Auerbach, however, is most extreme in his views. The Charedim were considered “black” (in keeping with their attire) and the religious zionists (with their white crocheted Shabbos Yarmulkes were the white ones). In truth, the right-wing of religious zionists, such as those from Yeshivat Mercaz HaRav, are easily “as frum” as the frummest Charedim, across the board, although they didn’t wear the uniform of hats and jackets or follow the dictates of Agudisten or “Daas Torah”. It’s no different in Melbourne. The Chabad Kollel is an arm of the general Chabad movement. People learn there for a couple of years and then go into Chinuch, the Rabbinate, or the general work force. It’s not a life time job to sit in Kollel. The Kollel is interested in people outside of Chabad, in the same way that Chabad is interested in anyone (with the exception of farbrente Misnagdim with whom they share no love). The Lakewood Kollel was split asunder by a massive disagreement between its own constituents which saw one Rosh Kollel go back to the USA and the other remain in his position. Many important Ba’aley Batim left the Lakewood Kollel, never to return. For many of the full timers, it’s a lifetime job, to “sit in Kollel”. The Lakewood Kollel isn’t really interested in Religious Zionists. It is mainly a common ruse to attract such people to attract funding to support their activities. Behind the scenes, religious zionists are not considered “frum enough”. This is no different to any other such institution around the world. It is not unique to Melbourne. The Adass Kollel keeps completely to itself. It is made up of people who have retired as well as young and not so young marrieds. It isn’t interested in the wider melbourne jewish world outside of its own hermetically sealed group and it certainly has no time for Religious Zionist types from a Torah perspective. Kollel Mitziyon, isn’t really a Kollel. It’s a quasi yeshivah and does a good job continuing the type of learning program that those who studied at religious zionist style yeshivas experienced before returning to Australia. It normally imports a Rosh Kollel and Israeli Hesder Bachurim; their Rabonim though are simply not treated with any respect by the other Kollelim or their constituents. So what honeymoon is over? Has there ever been a marriage? There has been a “quiet peace” between Charedim and Religious Zionists. While the latter learned in Yeshivos and went to the army, the former generally avoid the army at all costs because they see their torah learning as protecting Jews, and many also see it as a full time, life-long vocation. The new style Mizrachi party, Habayit HaYehudi no longer supports a carte blanche arrangement where significant numbers of Charedim are able to avoid going to the army and sit in Kollel for the rest if their lives. The retribution has been swift. Incredibly, joining the anti-semites and anti-zionists of the world, the Charedi parties have decided to no longer support produce from the “settlements” beyond the green line! I find this disgraceful. That they could give strength to the types of boycotts imposed by both Jewish and non-Jewish anti-semitic anti-zionists is simply breathtaking, but not surprising. They will stop at nothing to make sure that their sole vocation remains Torah study. To put it in other words, it would be akin to the Lakewood and Kollel Beis Yosef deciding that they would no longer use any businesses associated with the Mizrachi (religious zionists), here in Melbourne. Chabad, of course supports settlement activity given that the last Rebbe was staunchly against returning land for peace. Idle threats aside: I do not understand why the Charedim do not institute a Hesder system like the Mizrachi did so many years ago. Let them have a ten year Hesder program, where they do 3 years of army interspersed with an extra 7 years of Torah study. What would be so bad? But to boycott any place over the green line in the way they are proposing makes me sick in the gut, and convinces me even more that it was only ever a platonic “marriage”, and the honeymoon is now well and truly over. An excellent analysis of this deplorable situation in the frum world today. “Power corrupts and absolute power corrupts absolutely!” So said Lord Acton(1834-1902). Though we like to think of ourselves as better than the Nations, in many respects we are no different. IMHO the only reason that Jews have a name for being reasonable, equitable, fair and tolerant, aside from possessing (and studying) the Torah, is because of our long experience living as ‘guests’ amongst the Nations down the centuries of exile. Now we have our own country we are becoming (ala Herzl) ‘normalised’ and starting to behave ‘like’ them! When groups discard the lessons learnt as sojourners – democracy, responsiblity and accountability – the inevitable decay of fine personal interaction with people of different cultures and backgrounds commences. This is exactly what we are witnessing in Israel today, and it is no different from the growth of the Taliban and other extreme Islamic groups or other idealogical sects who put themselves above or outside the law. One of the major problems with Judaism today, and it does not bode well for the future as it makes a solution less likely, is the demise of the middle ground to either the left or the right. Judaism prosperred, although it produced a major ‘kulturkampf’, when it came up against the Greeks, similarly the experience initially of Arab culture in the first millenium and subsequently borne by the Christian rennaisance all allowed Judaism to take of the best ideas without being completely swamped by alien paradigms. We face an ominous future at our own peril if we choose to ignore the rest of mankind and technology to pursue what some perceive as ‘daat Torah’. May the People of the Book look with a wisdom borne of millenia of study not just into the Book but read well between the lines to glean the will and wisdom to continue to be a ‘light unto the Nations’ but first and foremost a light unto ourselves. People are not so sure what they really believe. 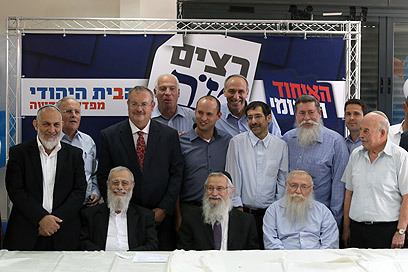 The fact that the Aguda and Shas are not in the new government maybe not an altogether bad thing. I have my doubts that the coaltion which Bibi cobbled together will last, Lpid and Bennett are odd political bedfellows, little in common except their present fixation on ” sharing the burden”, wait until ” giving back land” comes up for discussion. We can only hope that HaShem will show mercy and send Moshiach quickly. In the mean we must re-double our commitment to Torah Avodah and Gamilus Chasodim, always looking with the right eye at our fellow Jews, without judgement , especially those who disagree with us.